One of the first things I’ll do when I make a billion dollars is to commission the creation of a custom wagon of my choosing like all those oil-rich princes and sultans in the Middle East. 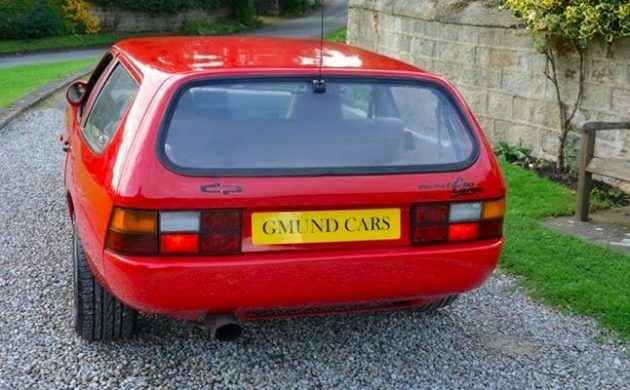 That seems to be something people did in the 80s when they got bored just buying eight examples of the same Countach off the showroom floor, as this custom wagon-bodied 924 Turbo here on the Gmund Cars website demonstrates. 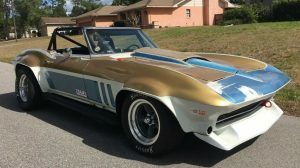 It is believed to be one of three and is listed for a cool £30,000, or about $40K U.S. at today’s rates. That’s actually a relative bargain, in my eyes, compared to the likely cost to create this wild-child breadvan. 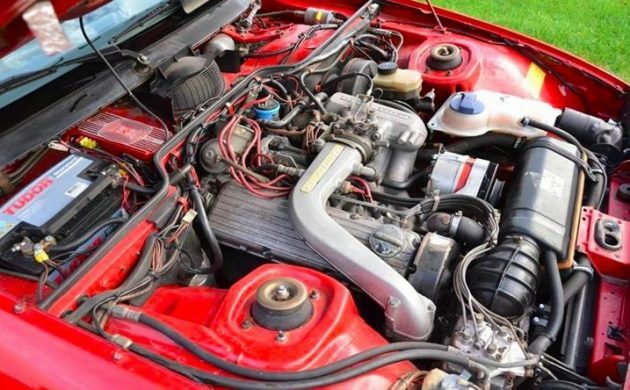 This example is believed to be the only one that featured the slimmer 924 bodywork, as the other two were converted to the fatter 944 fenders. 1980s Porsche tuner DP was the mastermind behind this creation, which also features a turbocharged 924 powerplant under the hood. 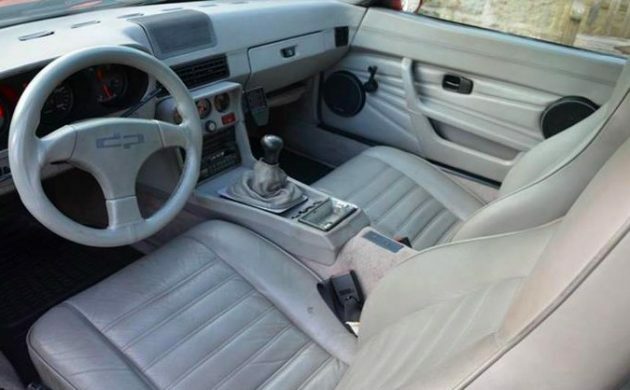 The cabin is standard 924-fare, aside from the cool period DP wheel and obviously plenty of added cargo space behind your head. 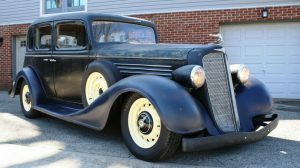 The DP Cargo was concocted using the rear shell of a Passat from the same era, which takes either a fair amount of ingenuity, alcohol, or more likely, both. Mileage is actually (and commendably) fairly high at 128,165 KM, so the previous owner(s) definitely put this custom 924 to good use. What some of you may consider ungainly I view as beautiful. Wagons really are wonderful vehicles in almost any form, with better handling and performance than contemporary SUVs. Throw in the ability to get a manual transmission in most wagons made in the last 20 years and it all adds up to make them an enthusiast-friendly vehicle. 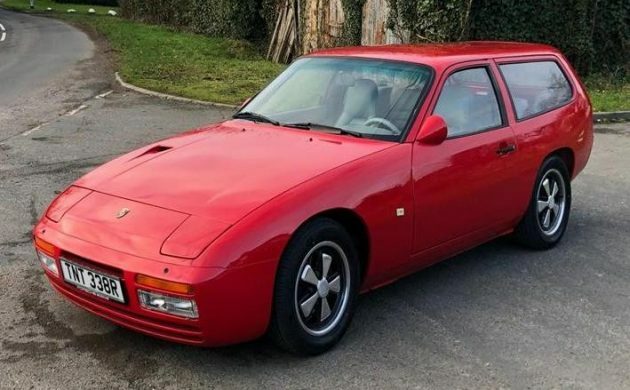 This 924 DP Cargo is a child of the 80s, and one of the few times you can own a vehicle that’s as practical as it is rare. I’m also in the it’s-beautiful camp! Nice find, Jeff. Just goes to show how disparate people’s tastes are. To me, everything after the door and above the belt line looks awkward. Hard to tell. The pictures look distorted. Agreed. The picture from the rear seems to show the right rear tire farther forward than the left rear. That cannot be. Side picture shows the car to be awkward in styling but I’m willing to bet it looks better in person. If it were mine I would investigate removing those back seats and creating one larger bed. No one fits back there anyway – especially not with only two doors. Makes me wonder if the rear seats fold forward at all? or as the Aussies say a „UTE“. I love this. Why wouldn’t everyone want sporting road manners and carrying capacity all in one package? My favorite current daydream is creating a ‘shooting brake’ Miata. Come on folks, wouldn’t that be cool? 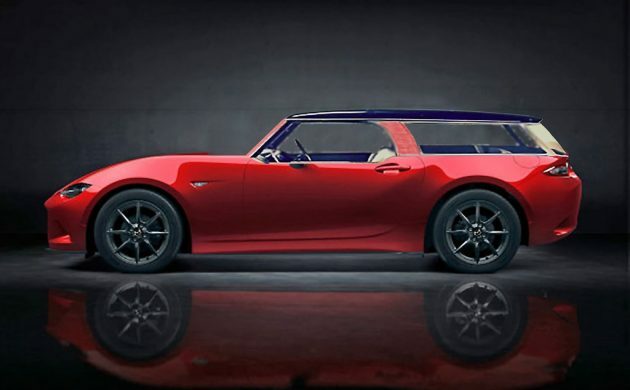 Which is kinda what my Mazda 3 hatchback is…..
Now those proportions look a little better. But still who wouldn’t want a P-Car Wagon? Well Done, Calvin S! If that image is your work, you’d better copyright it, and quickly, before Mazda realizes how cool it is! You’d either be a hit or get hit at the next PCA event. Put me in the like column on this one. The listing shows this as a 1976, but the nose is off a 1987-91 944. Looks good though. DP did some great stuff. I have always liked shooting brakes but this one looks a little awkward at the rear roofline. I think if instead of the roof turning up like a quasi small spoiler it just followed the natural line of the rest of the roof it would look much better. That would make the lift gate a more natural looking size as well. All that being said it is a neat car. If only the Mazda 3 was RWD! See, why won’t they just make that? One of my coolest was an Aston Martin DB5 “Radford” Shooting Brake. At the time we had no idea it would ever be so valuable. 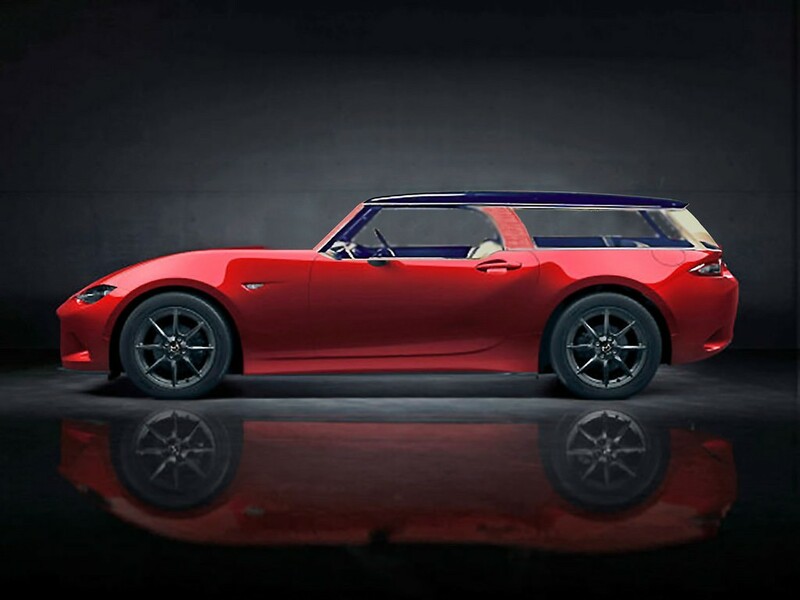 Very nice, great idea for a shooting-brake; I really would like to see it on the 944…those flared fenders would give it some visual muscle. 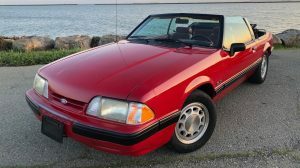 With an aging gearhead population (myself included) it would seem the shooting-brake design could make a strong comeback…especially with a turbo under the hood. Cute…in an ugly lapdog kinda way. Suddenly my wife’s Crossfire looks better to me. I am unable to find any overspray under the hood. Would you pinpoint the location? That’s a classic. Beautiful execution in a car that can actually be used. 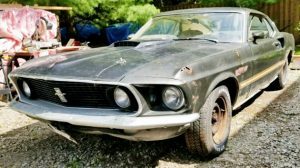 I can’t afford it, but I wish I could. Just off to check tonight’s LOTTO results …………… I’ve had 3x 924 coupes, 2x 924 Turbos and I would buy this in an instant if I had the space …………… aw dammit, the missus just told me we didn’t win the Powerball ……….. bloody shame! !